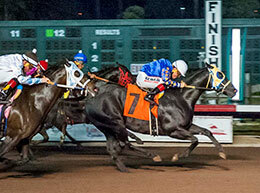 Kr Hi Five crosses the wire first in the Wild West Futurity Sunday evening at Los Alamitos Race Course. 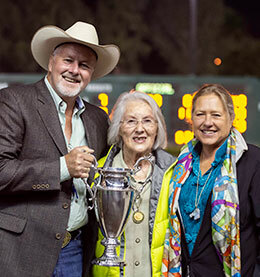 LOS ALAMITOS, CA—OCTOBER 28, 2018—More than 42 years since their initial involvement in Quarter Horse racing, Sally Kidd and her son, Dave, celebrated their first ever futurity victory after their homebred gelding KR Hi Five recovered from a slow start with aplomb to win the $136,850 Wild West Futurity on Sunday at Los Alamitos. Ridden by Jose Nicasio for trainer Jaime Gomez, the Colorado-bred KR Hi Five bumped at the start and found himself in fifth place in the 350-yard race. But the son of leading first-crop sire, champion Five Bar Cartel quickly found his best stride and coolly began to move to the front of the pack. By the halfway point of the race, KR Hi Five was on the lead and from there he held off K & R Allred Ranch, LLC's Arizona Favorite to win the Wild West by a half-length. Sent off at 6-1 odds, KR Hi Five covered the 350 yards in :17.601 to pick up his fourth career victory in seven starts. "We won the Lubbock Stakes (with KR Dragonfly in 2011), but never a futurity. We've been in this game since 1976. We're still here because my mom keeps wanting to breed mares and loving to breed mares. Another person would have quite, but my mom wouldn't. Now, here we are and we are so happy. We've knocked on the door for a long time, but tonight was it." Raising horses has been a tradition for the Kidd family for more than a century said Dave's wife, Alayna Kidd. "For (over 100) years their family has been breeding horses in Wyoming," she added. And now the Kidds of Steamboat Springs, Colorado have their futurity win. "It's incredible," said Sally Kidd. "I was praying for it. (KR Hi Five) is such a sweetheart. KR Hi Five's dam is I Bee Phia, who in 2016 finished second in the Cherry Creek Futurity and third in the Mile High Futurity. The now 14-year-old r Eye Opener mare earned $20,544 during her four-race career. "He's got a great momma," David Kidd added. "She had tough (luck). She injured her knee. She was the closest we came to a futurity win. Now she's got a baby that's won the Wild West." 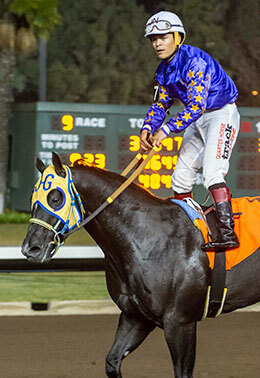 KR High Five, a winner of three consecutive starts at Los Alamitos, earned $57,477 for the win to take his career earnings to $72,136. For Gomez, this was his second straight training victory in the Wild West. He won the 2017 running with graded stakes winner Moonie Blues. 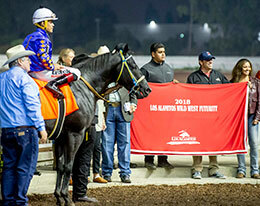 Trainer Jaime Gomez stands with Wild West Futurity winner Kr High Five in the Los Alamitos Race Course circle. "This horse is so calm and easy to saddle," Gomez said. "He's a nice horse. He's sound, strong and he's pretty wide. He has a lot of power." Ridden by Cruz Mendez for trainer Hector Magallanes, Arizona Favorite earned $23,265 for his runner-up effort in this race. The Favorite Cartel gelding had previously finished second in the Pot O' Gold Futurity at Sun Downs and fourth in the Firecracker Futurity at Grant's Pass. Tony Greaves' Mister FDD earned $16,422 for running third. The Utah homebred son of world champion sire FDD Dynasty was saddled by Lin Melton and ridden by jockey Cesar Franco. He earned $16,422 for the effort. Fastest qualifier Jess Send It, the 3-5 favorite, threw her head at the start and trailed throughout. The complete order of finish is as follows; KR Hi Five, Arizona Favorite, Mister FDD, CM Whatta About Me, Y Paint Linda, Ladys A Cartel, Staubauch, Jodee B Valiant, Justaczech and Jess Send It.